Storytelling is the trend of the moment in social media circles, and all the major platforms are working to provide more ways for users to add more context to their posts, and more creative, narrative-driven features. Snapchat started the trend with Stories, which enables users to share multiple images and short clips from their day, a feature which Instagram has since copied (and Facebook is now rolling out in their main app also). Twitter went with Moments, which hasn’t gained traction, but again, is narrative driven, providing a more complete picture on any given topic. 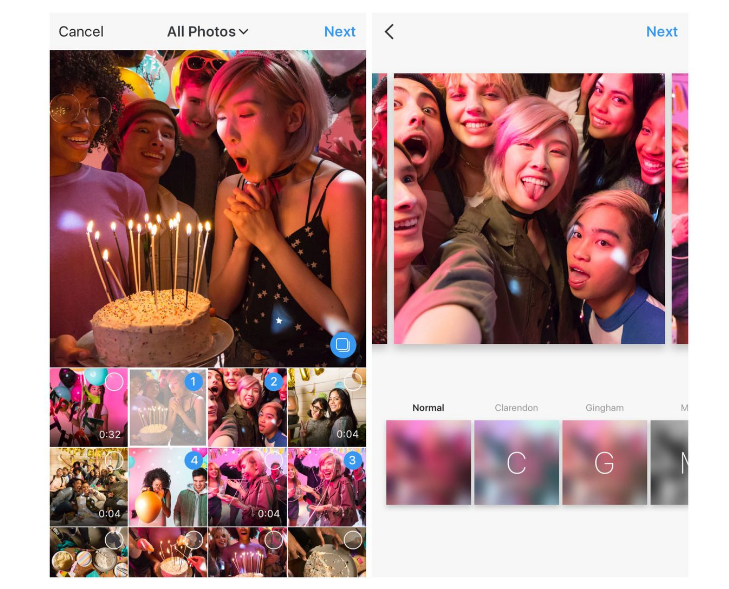 Adding to this, Instagram is today introducing another storytelling format, giving users the opportunity to share up to ten photos and videos in a single post, which viewers can swipe through. The new feature was first spotted in testing earlier this month, and it mimics the carousel ad format Instagram provided for advertisers back in 2015 (they added video to carousel ads last year). The format provides another way for users to communicate more context on the platform and provide a more comprehensive overview of any given subject. To create a multi-image post, you first need to tap the ‘Select Multiple’ option on the bottom of the photo or video you’re uploading. From there, you can select the content you want to include – they’ll be numbered in the order they’ll be presented in the carousel (you can rearrange the order by holding down and dragging on screen).